NCCF’s staff and the board of advisors of the Currituck-Dare Community Foundation were saddened to learn of the recent death of Milton Etheridge, one of our founding board members. We received this tribute from Peggy Birkemeier, retired NCCF associate. Milton Etheridge was a founding member of two nonprofit boards instrumental in providing services to Currituck County and in honoring the heritage and culture of the African American community of Currituck. 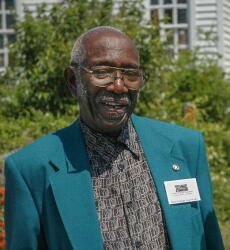 Milton helped to establish the Currituck-Dare Community Foundation beginning in 1999. Milton’s strength came from making connections with people to advocate for a better quality of life for residents and visitors to Currituck County. His second commitment came in 2002, helping to organize and lead efforts to establish the Historic Jarvisburg Colored School Association and to establish the HJCS Museum that shares the stories of all the historic colored schools in Currituck from the 1860’s through the 1950’s. His dedication, commitment and persuasion benefited everyone in Currituck County and we are grateful for his efforts. He will be missed by many. Donations in his memory may be made to the William A. and Julia Hunt & Douglas P. and Alice H. Lindsey Fund for Historic Jarvisburg Colored School (HJCS).